Samantha Syverson (Vikalp Women’s Group): Sam worked as a legal intern at Ocean Conservancy where she worked with a coalition of environmental groups lobbying for policy change in the wake of the Deepwater Horizon tragedy. At the time of her fellowship she was studying at the Georgetown University Law School, where she was an active participant in the Community Justice Project clinic. 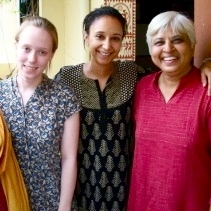 Sam was part of a clinic team which visited Vikalp in spring 2011, and she returned in the summer with fellow-student Meredith Williams to serve as an AP Peace Fellow. Sonu and Rekha both come from working class migrant communities from different regions and religions. Even after Section 377, transgender people and their partners will still be vulnerable to charges. Aren’t there bigger problems in India?